We may illustrate the method of calculation by considering the case n=6. The whole sign may be contained in one circle, or several. In the first case we call the sign 'prime'; otherwise, it is 'composite', and is the 'product' of several primes. Assuming n=6, if the sign is prime, then it consists of a sign made of 5 circles enclosed in one big circle, giving us 20 possibilities. In case the sign has two factors, the number of circles in the factors may be 5+1, 4+2 or 3+3. In the first case, the first factor consists of a sign made of 4 circles, enclosed in an outer circle; the second component is just an empty circle; giving us 9 possibilities. The second case gives us 4 possibilities. In the third case, each component consists of a sign made of 2 circles, enclosed in an outer circle. There are 2 signs made of 2 circles, so that looks at first like 4 possibilities. But we don't care which factor is which, so that 4 is reduced to 3. So that's another 16 signs with 2 factors. 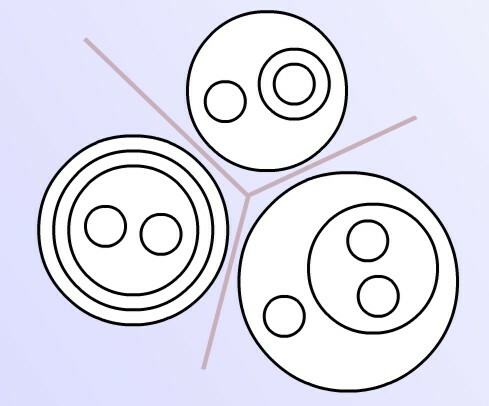 If the sign splits into 3 factors, the circles can split up as 4+1+1, 3+2+1, or 2+2+2. The number of signs here is 4+2+1 = 7. 4 factors: 3+1+1+1 (2 signs), 2+2+1+1 (1 sign). 5 factors: 2+1+1+1+1 (1 sign). 6 factors: 1+1+1+1+1+1 (1 sign, consisting of 6 empty circles). The total number of signs made out of 6 circles is 20+16+7+3+1+1 = 48; agreeing with the number given in the table. Even with just 6 circles, the 'bare hands' approach to calculating the number of signs is becoming pretty difficult; for higher n, we will definitely need to be more cunning. Here the whole sign is a product of three factors, each of which is prime in that it cannot be further divided. × ( _ + (OO) + (OO)(OO) + (OO)(OO)(OO) + ...) × etc. × (x0+ (OO)x3 + (OO)(OO)x6 + (OO)(OO)(OO)x9 + ...)× etc. 1 + a1x + a2x2 + a3x3 + ... = (1 - x)-a0 × (1 - x2)-a1 × (1 - x3)-a2 × (1 - x4)-a3 × etc. This constitutes a beautiful 'implicit equation' for the coefficients an, first written down by Arthur Cayley (who was analysing a different, but equivalent problem: the number of 'rooted trees' containing n nodes apart from the root). If all the ai up to i=n are known, then an+1 may be worked out. This works as follows. a0 is known: it is 1. a1 is the coefficient of x in the expression on the right-hand side. a1, a2, a3 etc. are as yet unknown, but that is immaterial, for no factors except the first can contribute to the coefficient of x, which is the coefficient of x in 1/(1-x), namely, 1. = b0 + b1x + b2x² + ... = g(x). bn-1 = the sum, over all d dividing n, of dad-1. a1 + 2a2x + 3a3x² + 4a4x³ + ... = (a0 + a1x + a2x2 + a3x3 + ...)(b0 + b1x + b2x2 + b3x3 + ...). The shaded cells are the ones that have to be added up and divided by 6 to obtain a6 (the answer is 48). Then b6 may be worked out, and the calculation continued to the next step. One might ask, how many of the signs with n circles have the value m (mark) and how many have the value n (not a mark)? The following table gives the answer, for the first few n. cn is the number of signs evaluating to no mark; dn is the number evaluating to the mark. Exercise: on the whole, it seems that more signs evaluate to m than to n. Calculate (using a computer) the limit, if any, of the ratio dn/cn as n goes to ∞. I make it about 1.8510988385 - but you may be able to improve on this value!